The 2019 Audi A5 Cabriolet is a 4 passenger Automatic transmission, 2-door Sub-Compact Passenger Car. It is available in 3 trim packages, the Premium, Premium Plus, and Prestige. The new Audi A5 Cabriolet invoice price ranges from $48,128 to $48,128, while MSRP ranges from $51,200 to $51,200. 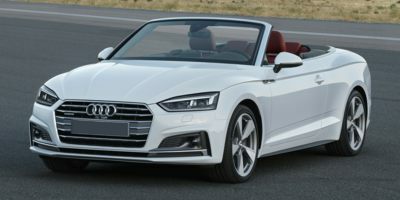 The 2019 Audi A5 Cabriolet is available in 9 exterior colors, Brilliant Black/Black Roof, Florett Silver Metallic/Black Roof, Glacier White Metallic/Black Roof, Ibis White/Black Roof, Manhattan Gray Metallic/Black Roof, Matador Red Metallic/Black Roof, Monsoon Gray/Black Roof, Mythos Black Metallic/Black Roof, and Navarra Blue Metallic/Black Roof, and 4 interior colors, Atlas Beige, Black, Nougat Brown, and Rock Gray.